CW3E director Marty Ralph provides a short diagnosis of an interesting case with a variety of features coming together to generate very large IWV in this currently landfalling storm. 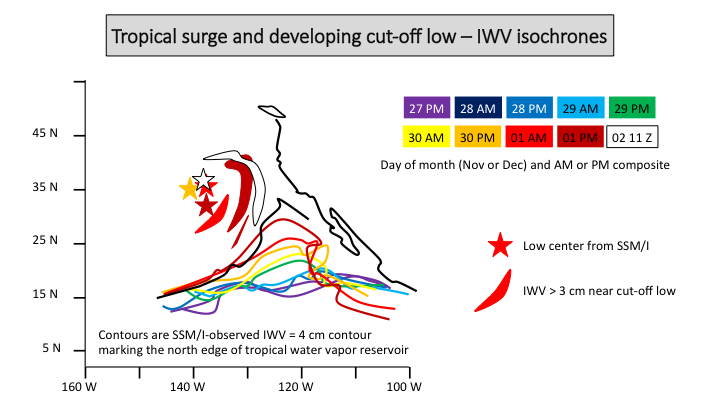 The attached ppt includes an isochrone analysis of the northern edge of the tropical water vapor reservoir (using 4 cm IWV – summary shown above and in slide 10) and its landfall (as seen in the GPS-Met network – slide 11). Also, the snow levels are well-observed with the new SLR network and shows strong north-south variation (slide 12).. Forecasts are available from the California Nevada River Forecast Center (CNRFC): click here for precipitation forecasts.. Forecasts are also available from the weather service forecast office of the National Weather Service in San Diego: please click here.